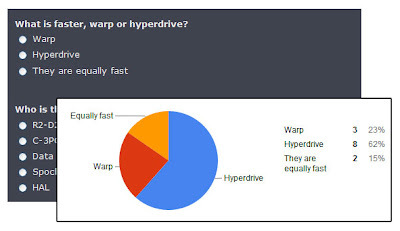 Google Drive Blog: Which is faster, warp or hyperdrive? Which is faster, warp or hyperdrive? from their co-workers and customers. To contrast these more "practical" uses, I thought that I'd share three fun surveys that you can send to your friends: one for Star Wars and Star Trek fans, another that lets you find out what your friends think about you, and one with 18 totally random questions (just because). After your friends submit their answers, you'll be able to see nifty summary charts like the one above. According to my friends, hyperdrive is faster than warp. Would your friends agree? Preview the three surveys below and choose one. Customize the survey with a personal message and even add your own questions and answers. Email the survey to your friends. Sit back and watch as the results come in. By default, your friends will be able to see each others' responses as well, but you can change this setting before sending out the survey if you'd like. For those of you that would like to create a form from scratch, you can go to your Docs List and click New > Form. Have fun with these forms. Update: Several people have mentioned that they're enjoying the lively discussion (and sometimes debate) after filling out the survey. A common question has been, "How do I share the results with my friends?" An easy way to do this is to change the sharing options for the spreadsheet that holds the survey results. You can add your friends (using their email addresses) as viewers of the underlying spreadsheet and email them a link to the spreadsheet. More and more people have started using forms to collect information from their co-workers and customers. To contrast these more "practical" uses, I thought that I'd share three fun surveys that you can send to your friends: one for Star Wars and Star Trek fans, another that lets you find out what your friends think about you, and one with 18 totally random questions (just because).